Just wanted to send you an update. Brett turned eight last Saturday (May 22), and he gave me a birthday present! We were champion in both of our divisions, classes of 14 & 16! He was fantastic! 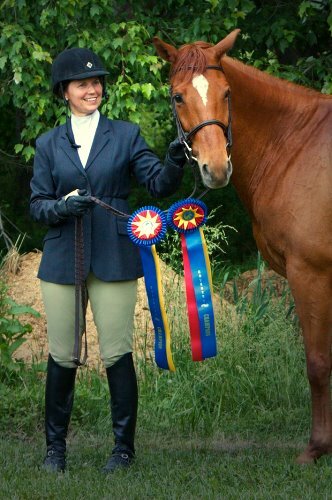 I’ve attached a photo of him with our ribbons. Congratulations Judi! We are all very proud of our boy Brett. He was always a pleasure to ride and train and it is wonderful to see what these Thoroughbreds can do with the right training. Judi purchased Brett from Bits & Bytes Farm in September 2006. Read Brett’s older success stories on the Bits & Bytes Farm Web site. See more photos on Brett’s Photo Gallery.